A third-party partnership is a staple of the public relations repertoire at many successful agencies. Opportunities expand when smart agency teams find ways to shape a multi-dimensional partnership where each side succeeds. Make sure your messages are aligned. 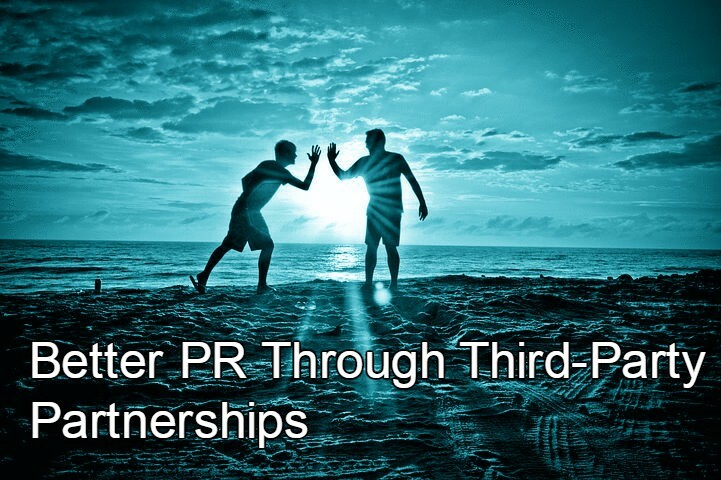 The best PR partnerships are borne of positions or values that are similar or consistent. For example, Edible Arrangements, providers of healthy fresh fruit snacks, sought to partner with a nutrition organization to build awareness of the “healthy” aspect of its brand positioning. We brokered an arrangement between the company and the Society for Education Nutrition Education and Behavior. The SNEB works with schools and is dedicated to promoting effective nutrition education and healthy behavior. Our program focused on school celebrations like Halloween and birthdays to offer healthful alternatives to candy and sweets. We worked closely with SNEB leaders to make sure our messaging about healthy snacks for children hewed as closely to theirs as possible. We even helped the client create a special product just for school celebrations that the SNEB could get behind. It was the beginning of a beautiful relationship. Where possible, work with clients to offer opportunities for shared exposure with other category players. One way we do that at Crenshaw is through thought leadership panels that sometimes include competitors discussing and debating topics of interest to the industry. One panel we convened — for online art site UGallery, for example — even included its own competitors, which ordinarily a no-no, but in this case helpful for UGallery to be compared to larger companies in the space. Most recently, on behalf of interactive content developer Arkadium, we arranged a panel discussing tech in the newsroom. Our partners for the event included publishing brands Gannett and the New York Daily News, sharing a stage and resulting positive press. Be fearless in dreaming up potential partnerships. The brilliant PR person for Scotch-Brite lint rollers who dreamed up the idea of a pop-up lounge for the “Dogs of Instagram” had vision, and then some. When was the last time the NY Times provided such brand-heavy coverage? Not in a dog’s age! But what makes this influencer partnership so fun is the sight of the most mundane product we can think of – a lint roller – featured in such a way. The sheer pleasure of seeing adorably photogenic pups decked out in Scotch-Brite logo-wear frolicking on Scotch-Brite upholstered sofas is joyful, low-concept and perfect. Treat partner companies as clients. PR agencies should treat ancillary relationships with any companies as potential clients. This is just smart business since you never know where your next client will come from. But it’s also valid advice when designing a program to benefit your client as well as the strategic partner. Gain an understanding of their PR goals, corporate culture, media dealings and leadership sensitivities to help you create a plan that not only benefits both parties, but offers a sense of smart stewardship on your part. In our promotion of Small Town Breweries’ “Not Your Father’s Root Beer,” we helped foster a partnership with a regional ice cream brand, Graeter’s. Our team worked closely with the Graeter’s PR group to ensure equal billing for the two in press materials, product deliveries and media coverage. Feature celebrities in meaningful ways. As long as your client has the resources, partnering with a celebrity can be a pretty effective way to garner positive press. It’s never a guarantee, as we’ve seen with the Pepsi/Kendall Jenner misfire. But, done well, a celebrity partnership can be more than a pretty face and a product. We particularly like Visine’s promotion featuring Hillary Duff. It’s smart, targeted and just makes good sense. Visine enlisted a popular TV star with a young following to talk up the benefits of Visine when binge-watching your favorite shows. But it doesn’t stop there; the program Visine developed to help people binge watch more comfortably has a great CSR component as well. For each #ScreenOn hashtag used on Twitter, Visine donates a dollar to AdoptAClassroom.org to provide classrooms with educational technology. Using Duff, the demographics are right, the campaign is buzzworthy and the product delivers. That’s a true PR vision come to life. As with any PR program, measuring success against predetermined KPIs is the way to determine effectiveness and ROI. Both are critical when considering future programming. A good first step is to work with your partners to establish the KPIs. For instance, in a media relations-focused campaign, readership quantity and quality; sentiment; and share-of-voice might all be considered important indicators of success. Other success metrics might include anticipated media coverage (number of placements, type of outlets, geographical reach) as well as estimates on the percentage of stories featuring one or more key messages and the expected tone. When well executed, a third-party partnership incorporating the tips above should be able to meet and exceed goals.